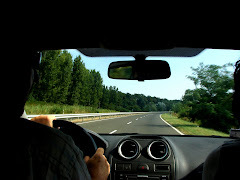 Backseat Driver: Is God Organic, Jesus Simple, and the Holy Spirit Missional? Is God Organic, Jesus Simple, and the Holy Spirit Missional? Okay, I'm on a writing roll. I don't post a blog for months and now two in a week. What's up with that? I write this blog mostly on aspects of what I and others call organic, simple, and missional church. After a few conversations this week regarding the validity and definition of the terms, I've gotten a bit frustrated with how people are separating them from each other. That somehow they exist apart from each other. Over the years, I've always made a point of joining them together, and now I'm even more committed to that practice. I'll use the example of the Trinity being One, but all separate parts with unique attributes and purposes. For the purposes of this blog post, and not to form any kind of divergent theology, I'll make the point that God really is organic, that Jesus made it all simple, and the Holy Spirit is profoundly missional. I've written so much in the past on this blog, about how I define the word organic. But for those of you who may be new readers, or old readers who need a refresher, here it is again. Basically, organic means to me; God initiated, God activated, God generated, God cultivated, God sustained. God is the essence of what organic is. It's Him. Only Him. Not the flesh, not good programs or strategies, not someone's current best seller on the topic, not current marketing techniques, or the latest fad in church growth. It's not "honey I shrunk the church" into the same form of church as what meets in a building every week, only now shrunk down to fit into a home. What is organic may meet in a building, or anywhere else. Where people experience organic church is really not that important. That people experience God in a living and present way, is what is important. God and His initiatives, His agenda, His interactions with us. As Jesus prayed; "Thy will be done on earth as it is in heaven." His will, now, today, everyday. "Doing church" in this way assumes a relationship that knows how to listen in intimacy and requires abiding in Him. It is a relationship of close affiliation and attention to that "still and small voice". It acknowledges that anything apart from Him is worthless. It assumes that God has a unique plan for the day, and He wants to share that with us. Jesus Himself, who sought the Father every day for the unique plans of the Father for that day, is our example in how to live simple church. Jesus says that, "he did only that which the Father is doing". He didn't make up his own strategies, or complicated the instructions from the Father. He just listened and obeyed. Simple. If Jesus felt it necessary to walk in this way, why would we think we can do it differently? Although simple, it does require some things from us. Effort to seek Him, practice in listening to Him, patience to wait on Him, and the faith to believe in, and move with Him. No wonder that some people quickly take the easy way and pull away from this dependent relationship with God. Scriptures say, "And without faith it is impossible to please Him, for he who comes to God must believe that He is and that He is a rewarder of those who seek Him. Hebrews 11:5-7. Without this dependent intimacy, the flesh soon rises to substitute a replacement. Soon that substitute turns into a system, then rules, and finally a religion. And we all know that religion kills the Spirit. Same ole', same ole'. To that I say, no, don't stop there! Your only 2/3 the way! This is not all about YOU! When Jesus left, he gave us the Holy Spirit to be the outward expresser of the Father and Son to us. The Holy Spirit is the missional communicator of God and Jesus. The outward and manifested reality of the Father and Son to us, so we can know and experience them in a myriad of ways. The Holy Spirit has His mission - to reveal the Father and the Son and bring the reality of their existence to us. Missional. We are called to share this mission also. To give the good news of knowing Christ intimately through the gift of salvation with others. In all the relationships of our lives. To those who know Him, and those who don't. "How will they know Him unless someone tells them, and how will someone tell them unless they are sent? Romans 10: 14-16. That's organic, simple and missional church. Don't pull them apart. Katie, this article is spot on - and so important. Somebody needed to say this. Church is so much the poorer whenever any one of these three elements is left aside. I've added a link from a list I'm calling 'Organic Wine' and I'll be recommending it to my readers. Chris, your encouraging words are a huge blessing to me today. Sometimes you wonder if anyone is finding value and merit in the posts, or I'm just "spitting in the wind". Thanks for letting me know you did, and of recommending the post to your circles of influence. May the Lord be honored and His Kingdom advanced! Thanks again brother! I love the analogy with the Trinity. The same, but uniquely different. I think that part of the challenge in bringing these concepts together is that different churches are at such different places in this day and age. That may not be ideal, but it is real. So even as the law is a schoolmaster to bring us to Christ, so I see that for many a so called missional understanding may lead through obedience to experiencing the joy and exuberance of the Holy Spirit drawing us to desire what God the Father and God the Son desire. Acts 5:32 "How much more is the Holy Spirit given to those who obey Him."